Please join Marlene Trestman for a discussion of her book, Fair Labor Lawyer: The Remarkable Life of New Deal Attorney and Supreme Court Advocate Bessie Margolin, YLS’ 33 on Wednesday, September 28, 2016, at 6:10- 7:00 PM, SLB 128. Commentary by Linda Greenhouse ‘78 MSL. 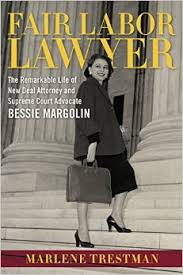 Through a life that spanned every decade of the twentieth century, Supreme Court advocate Bessie Margolin shaped modern American labor policy while creating a place for female lawyers in the nation’s highest courts. Despite her beginnings in an orphanage and her rare position as a southern, Jewish woman pursuing a legal profession, Margolin became an influential Supreme Court advocate. In this comprehensive biography, Marlene Trestman reveals the forces that propelled and the obstacles that impeded Margolin’s remarkable journey, illuminating the life of this trailblazing woman. A graduate of Tulane and Yale Law Schools, Margolin launched her career in the early 1930s, when only 2 percent of America’s attorneys were female, and far fewer were Jewish and from the South. According to Trestman, Margolin worked hard to be treated as “one of the boys.” For the sake of her career, she eschewed marriage—but not romance—and valued collegial relationships, often engaging in late-night brief-writing sessions or the occasional poker game. But her personal relationships never eclipsed her numerous professional accomplishments, among them defending the constitutionality of the New Deal’s Tennessee Valley Authority, drafting rules establishing the American military tribunals for Nazi war crimes in Nuremberg, and, on behalf of the Labor Department, shepherding through the courts the child labor, minimum wage, and overtime protections of the Fair Labor Standards Act of 1938. A founding member of the National Organization for Women, Margolin culminated her government service as a champion of the Equal Pay Act, arguing and winning the first appeals. Margolin’s passion for her work and focus on meticulous preparation resulted in an outstanding record in appellate advocacy, both in number of cases and rate of success. By prevailing in 21 of her 24 Supreme Court arguments, Margolin shares the elite company of only a few dozen people who attained such high standing as Supreme Court advocates. Trestman is a former Special Assistant to the Maryland Attorney General, where she started her thirty-year legal career in 1982, and has taught law at Loyola University of Maryland’s Sellinger School of Business & Management. Trestman received the Attorney General’s Exceptional Service Award twice and in 2004 was named Isidore Newman School’s Distinguished Alumnus. A former trustee of Goucher College, she currently serves on the board of Goucher’s Prison Education Partnership. Linda Greenhouse ‘78 MSL is a Senior Research Scholar in and Lecturer in Law.